A strengthening winter storm will bring the potential for windswept snow and travel disruptions from the central Rockies to the Upper Midwest early next week, including on Groundhog Day. While the exact timing and extent of wintry weather are not set in stone at this point, early signs are pointing to the threat for moderate to heavy snow, poor visibility and travel disruptions along a 1,000-mile-long swath. SEE ALSO: Could the eastern US face more snow later this week? The track and strength of storm that rolls ashore in California on Sunday will determine the coverage and intensity of the snow and wind from Colorado to Minnesota, Wisconsin and the Upper Peninsula of Michigan. According to AccuWeather Meteorologist Becky Elliott, "The threat for heavy snow will begin along the Front Range from New Mexico to Colorado and Wyoming on Monday." Snow will then spread across the the central Plains during Monday night. The swath of snow will reach the Upper Midwest on Tuesday and Tuesday night. The major cities and airport hubs of Denver and Minneapolis could be affected by the storm. 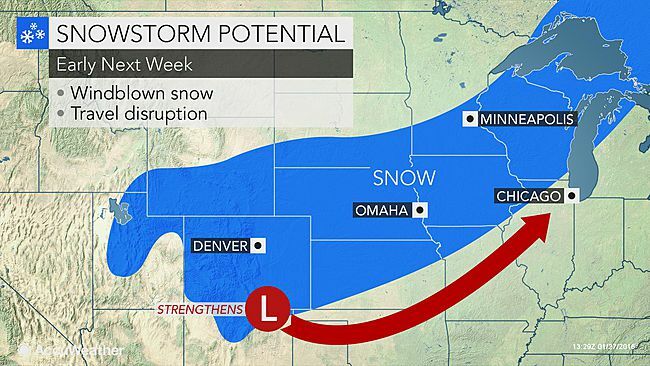 Denver could receive its biggest snowfall of the season so far from the storm early next week. The biggest single-storm snowfall this winter was 7.7 inches on Dec. 15. During January, only 3.6 inches of snow has fallen. People venturing across portions of interstates 25, 29, 35, 70, 80 and 90 in the central U.S. spanning Monday into Tuesday will want to monitor the progress of the storm as it unfolds. As the storm strengthens, increasing winds can cause extensive blowing and drifting of snow. "There is the potential for blizzard conditions to develop as the storm strengthens, so residents should keep that in mind as they make preparations over the weekend," Elliott said. The storm is projected to strengthen along a 40- to 60-degree-Fahrenheit temperature boundary separating building warmth over the southern Plains and Mississippi Valley from a charge of colder air over the northern Plains and Rockies. Temperatures over the middle Mississippi Valley will surge into the 60s to perhaps near 70, while temperatures plunge into the teens and 20s over parts of the central and northern Plains early next week. The storm will bring a wide range of weather, including the risk of violent thunderstorms in the storm's warm sector, early next week over the Central states.